This textbook/software package covers first-order language in a method appropriate for first and second courses in logic. The unique on-line grading services instantly grades solutions to hundred of computer exercises. It is specially devised to be used by philosophy instructors in a way that is useful to undergraduates of philosophy, computer science, mathematics, and linguistics. 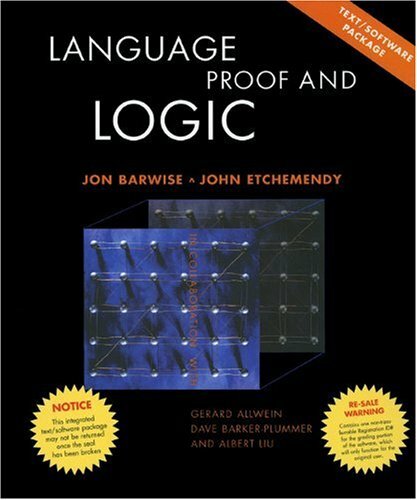 Advanced chapters include proofs of soundness and completeness for propositional and predicate logic, as well as an accessible sketch of Godel's first incompleteness theorem. A book on the topic of using probabilistic models in scientific work on language ranging from experimental data analysis to corpus work to cognitive modeling. The intended audience is graduate students in linguistics, psychology and computer science. This introductory book looks at all aspects of Machine Translation: covering questions of what it is like to use a modern Machine Translation system, through questions about how it is done, to questions of evaluating systems, and more. This text provides an introduction to the maximum entropy principle and the construction of maximum entropy models for natural language processing. We investigate the implementation of maximum entropy models for attribute-value grammars.